The holidays are a time for family and friends and relaxation. Unfortunately, many suffer from holiday stress every year at the same time. 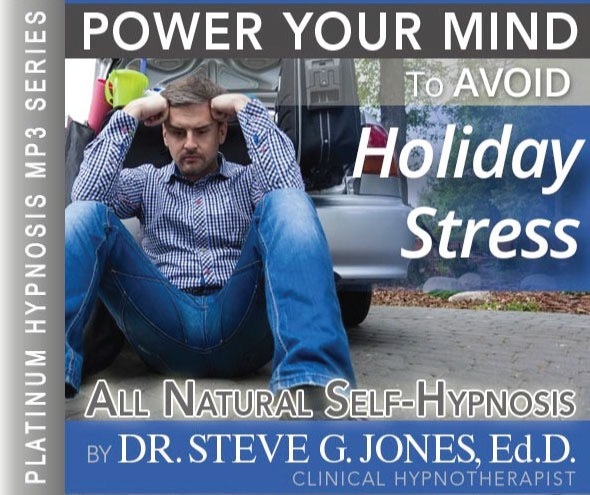 The Avoid Holiday Stress Hypnosis MP3 can help you to deal with deal with the holidays and get some stress relief through a relaxing process. Stress is something we all complain about yet a definition of it alludes us. There innumerable definitions around, but one of the most useful is: “Stress is any change to which you must adjust”. Most of us think of stressful situations as being negative: illness, death of a friend or loved one, being fired from your job, flunking out of school, divorce and so on. But situations commonly thought of as positive produce stress as well: moving to a new home, getting a promotion, going away to college, getting married. Stress comes from external and internal sources. It may come from the environment, or from the body and/or the thoughts and emotions. This Avoid Holiday Stress Hypnosis MP3 session is useful in teaching to reduce the stress. In addition, other techniques such as nutrition, time management, assertiveness training, autogenics, visualization, meditation, breathing, job stress management and biofeedback can be employed. Use this powerful Avoid Holiday Stress Hypnosis MP3 audio to help you enjoy your Holiday! Steve G. Jones, Ed.D., Clinical Hypnotherapist, charges $1,500 for a custom recording and $25,000 for a one-hour private hypnotherapy session at his office. But you can get all the benefits for this low price. Simply listen to the Avoid Holiday Stress Hypnosis MP3 recording every night as you go to bed for three weeks and feel the changes happening in your life. You will feel more empowered, more in touch with your true self, and you will truly know that your goals are within your reach. Steve G. Jones achieves AMAZING and LASTING results!!! Hypnosis is the easiest way to affect change in your life because the positive messages go straight to your subconscious mind effortlessly so you can accomplish your goals and reach for the stars!! All you have to do is listen to the Avoid Holiday Stress Hypnosis MP3 audio at night as you go to sleep!!! You’ll hear soft music, the gentle sounds of the beach, and the soothing sound of Steve G. Jones’ voice all working together to bring about positive changes in your life easily and naturally. Steve G. Jones has been helping people improve their lives with hypnosis for over 17 years…now it’s time for him to help YOU… don’t wait, do it NOW !!! you’ll be glad you did. See you at the top! And as you relax and drift deeper and deeper and more deeply relaxed, you realize just how relaxed you are. And as you relax and drift deeper and deeper and more deeply relaxed, you realize just how relaxed you are and I would like you now to imagine yourself entering the holidays with a very cheerful disposition, that’s right. See yourself at the holidays and you are so relaxed and happy. You are completely at ease. I would like you now to think about all the wonderful things that happen during the holidays, so many wonderful things. It’s as if the wonderful things happen every moment for you during the holidays. You find that you are happy. You are well rested. You are at ease and peaceful and you realize that whatever happens to you during the holidays, you will be able to handle it easily and effortlessly because you are so relaxed. And I would like you now to imagine that surrounding your body is a very protective shield and you may choose the form of this shield, it encircles your body and this allows any outside stress to bounce off and away from you, bounce off and away, leaving you relaxed and at ease and very focused on having a wonderful time during the holidays. And at anytime you can imagine this very powerful shield protecting you, allowing you to relax and enjoy yourself. And any stress that comes from within simply leaves your body through the bottom of your feet. Imagine now any stress just draining from your body through the bottom of your feet, that’s right. Allow that stress to drain away, leaving you completely relaxed. You are so very relaxed and so focused on having a wonderful time during the holidays. So relax now and realize that everything is just fine. You are completely at ease and ready to enjoy the holidays. The holidays can be a very joyous time and it can be a very stressful time. Hypnosis can help you get the most out of the holiday season by reducing stress and increasing both your happiness and your energy levels. Sharing the holidays with family can cause added stress. There are a lot of people to buy gifts for, there are meals to prepare, cards to be sent and countless other things to do. We all feel as though the holidays should be a time of relaxing and spending time with people you care about, but it is hard to relax with so many things to do! The Avoid Holiday Stress Hypnosis MP3 recording can help you relax and relieve stress during the holidays. The soothing ocean sounds in the Gold series and the relaxing binaural tones in the Platinum recording will allow you to take time for yourself before going to bed. The holidays do not have to be stressful! You can feel relaxed and at ease during the holidays by using this hypnosis program. This powerful recording will help you get through the holidays stress free by targeting your subconscious mind to relax and enjoy yourself. Entertaining during the holidays just got a little easier with this self-hypnosis recording. Perhaps you get stressed during the holidays because you do not have the “perfect” family. Whether you do not have family to spend the holidays with or you are not close to your family, this hypnotherapy session will help you. The Manage Holiday Stress hypnosis MP3 will help you appreciate the little things around you and it will help you relax and enjoy this time of year. No matter what stresses you out during the holidays, Steve’s program will help you enjoy yourself stress-free this holiday season!